Enjoyed it very much. I would recommend it to anyone who loves American history. A good example of what we were as apposed to what we now are. A country that can do so little. Except decline and retreat from our great past. Great Beginning with Stephen Ambrose introduction. Went rapidly downhill from there. What a real shame. The Narrator Really Sucked. Could not even get past the first 300 words. actually, put me to sleep. Would have been a lot better-off just reading the book. Very fascinating behind the scenes look at the building of the transcontinental railroad. Most of it was new info to me. Amazing the feats that were accomplished with so little technology back in those days but so much ambition, grit and manpower! This book may be a historical successor to “Undaunted Courage,” but I didn’t find it nearly as interesting or engaging. 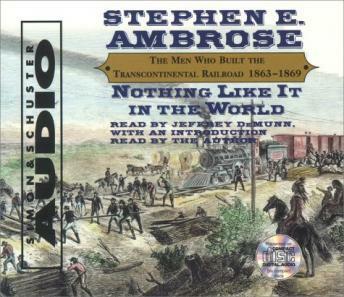 The story of the transcontinental railroad is very interesting, and Ambrose does a good job putting the whole affair in proper perspective as one of the most important man-made achievements ever. However, due to the sheer number of people involved in the process, the book – at least the abridged version – doesn’t have the time to develop the main characters, outside of 1 or 2 very important people. Also, if you listen to this book, it would be helpful to have a map nearby so you can visualize the constant geographic references Ambrose makes about the path of the railroad. Fascinating story of those who worked on the Trans-Continental Railroad. Provides a good account pointing out both the good and the bad of those involved in the project. Very interesting and enjoyable. Love the narrator.